Yesterday saw the start of Wimbledon and there is something about Tennis and Wimbledon in particular that goes together with strawberries and cream in the English Psyche. Could it be the 23 tonnes of strawberries and 7,000 litres of cream every year that the tournament gets through. Or is it that Wimbledon signals the start of summer for many with the dreams of hot lazy days, that sadly so often is not the reality of a British summer. 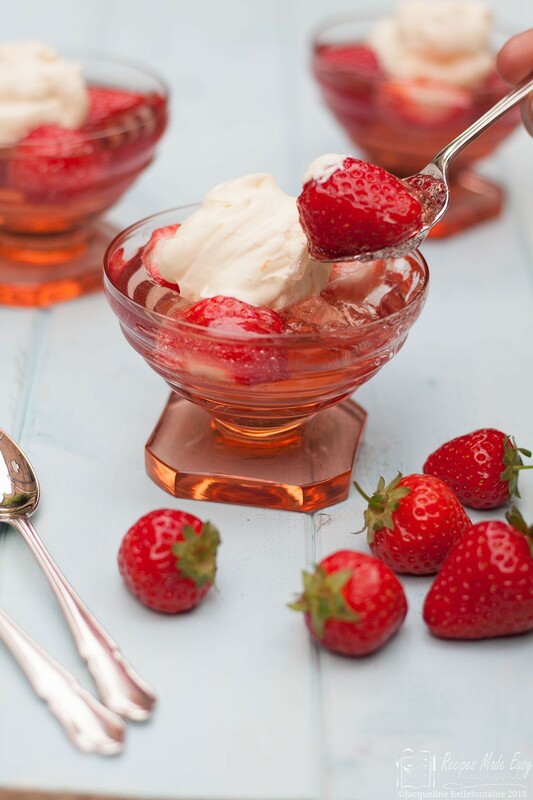 Even if the summer or Andy Murray’s performance doesn’t always live up to expectations, you can rely on strawberries and cream always being a winning combination. 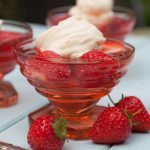 Strawberry jellies with chantilly cream is my twist on strawberries and cream this year and is a slightly alcoholic take on this classic flavour combination. 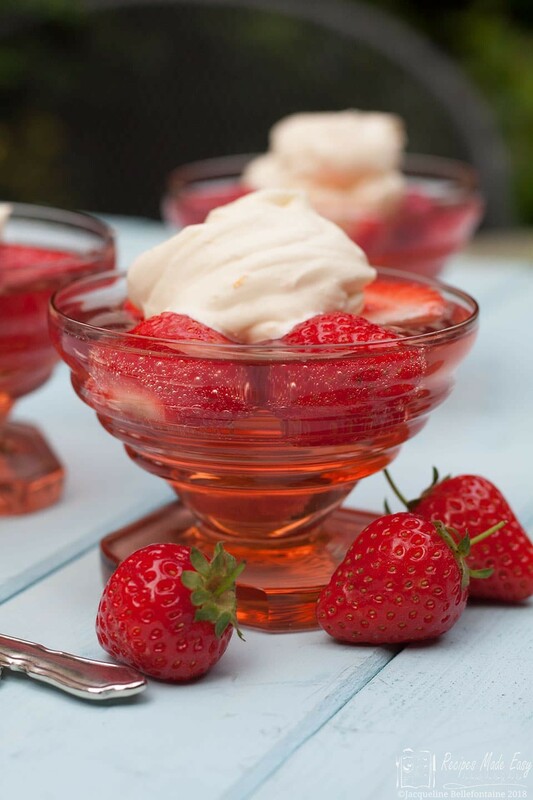 Strawberries set in a delicious rose wine jelly and topped with a orange scented Chantilly cream. They take only minutes to prepare, so if your a tennis fan there is no need to miss any of the action while you are in the kitchen. Go ahead and treat yourself to this delicious summer dessert. Hull the strawberries and divide between 4 – 6 serving glasses. 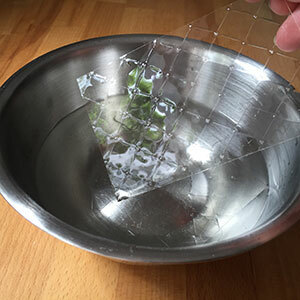 Soak the gelatine sheets in cold water for about 5 minutes, to soften. Place the sugar in a saucepan and and add 150ml of the wine. Heat gently stirring until the sugar dissolves. Remove the gelatine from the water and squeeze out the excess water. Add to the pan and stir until dissolved, then stir in the remaining wine. Pour into the glasses and chill in the refrigerator until set. About 3-4 hours. Place all the ingredients in a mixing bowl and whisk until the cream is just holding its shape. Spoon or pipe onto the jellies and serve. Can be made upto 24 hours in advance. Dissolve the sugar in 150ml of the wine. 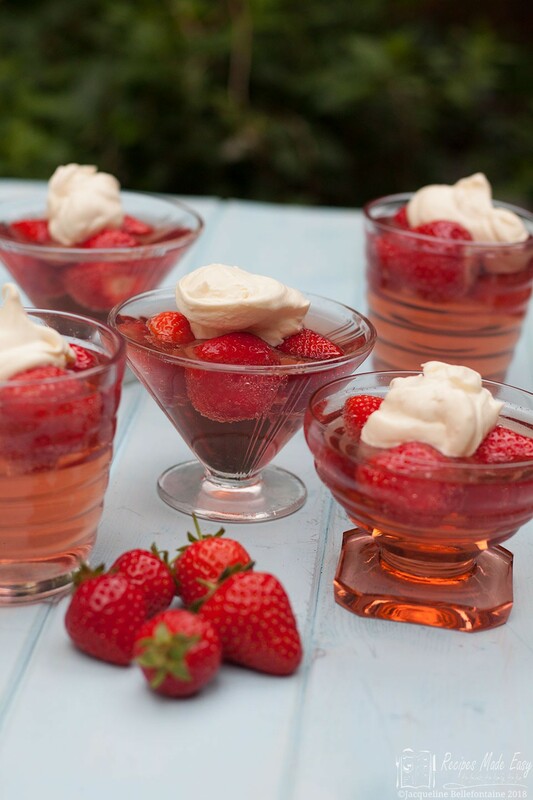 Divide the strawberries between the glasses and fill with jelly. Allow to set. Whip the cream with the liqueur, orange zest and icing sugar until just thickened. Spoon the cream on top of jellies before serving. In the past I could only get powdered gelatine and leaf gelatine was hard to find. Now I find the opposite is true so I have given the recipe with leaf gelatine. If you can only get powdered you will need one sachet. Sprinkle the sachet over 2tbsp of water in a small bowl and allow to go spongy. Place the bowl in a pan of hot water and stir until dissolved. Add to the recipe in place of the soaked leaf gelatine. 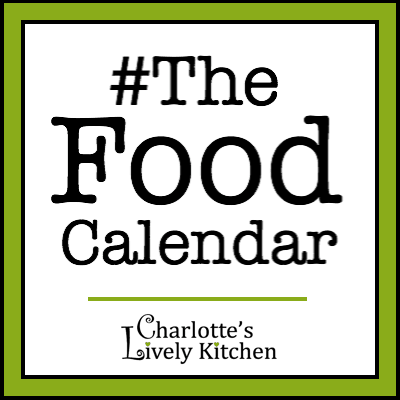 Given a choice I would use leaf gelatine over powdered as it gives a very clear, tasteless set. Sparkling wine gives a light tingle to the palate but you could use regular rose wine instead. If the strawberries are large, cut in half before adding to the glasses. If you wash the strawberries before use, make sure that they are completely dry otherwise you will end up with a less flavoursome jelly which may not set if it becomes too dilute. These as you say are the grown up version of jelly and fruit. I find adding little liqueur or orange zest to cream a great “cheat” to take cream that little more decadent and it so easy. These look gorgeous! Using rose wine is such a fab idea. This sounds lovely, I really love the taste of champagne soaked strawberries so I’d imagine that rose tastes just as yummy. I completely agree that it feels like summer has started once Wimbledon is on – sadly the weather doesn’t seem to agree!